Saturdays, May 7, 14 & 21 at 8 p.m.
Sundays, May 8, 15 at 7:30 pm. Tickets: $20; $13 for students, over 65, groups of 6 or more. Available through http://www.brownpapertickets.com/event/163866 or by calling 1-800-838-3006. Described in Boston Magazine as "a unique initiative in the performing arts in the city," Fort Point Theatre Channel is pleased to announce its production of Hotel Cassiopeia, by Charles Mee. “This fantasy inspired by the life and work of the master of assemblage art, Joseph Cornell, will itself be an assemblage,” notes Sylvie Agudelo, concept director and production designer for Hotel Cassiopeia. Robert D. Murphy, who has performed with many of the area’s finest theatre companies, will play Joseph Cornell. A member of Actors’ Equity, Murphy starred in Fort Point Theatre Channel’s acclaimed 2008 production of The Time of Your Life, which was set and performed in a Fort Point saloon. The cast also includes: Jake Berger, Mary Driscoll, Silvia Graziano, Meredith Stypinski, Nick Thorkelson, Allison Vanouse, Rick Winterson. The design and production team, led by Agudelo, includes Jennifer Hardy (choreographer), Andrew Neumann (composer), Robin Reilly (costume consultant), Todd Sargent (lighting design), Nick Thorkelson (set design collaborator, graphic design), Douglas Urbank (film design), and Mark Warhol (sound design). Accompanying the production will be a series of “Constellations,” artistic exhibitions curated and created by Agudelo, the Hotel Cassiopeia design team, and guest artists at various locations in Fort Point and other parts of Boston. In conjunction with Hotel Cassiopeia and “Constellations,” Liliana Folta, an internationally known artist now living in Fort Point, has created "Cassiopeia Behind the Scene." This painting is being raffled off to support Fort Point Theatre Channel. Born in Argentina, Folta is a multidisciplinary artist working primarily with acrylics, ceramic sculptures, and installations. Her inspiration for "Cassiopeia Behind the Scene" comes from the assemblages of Joseph Cornell. Sylvie Agudelo, a Boston artist, is delighted to have been invited to work on concept and design for this production because of the opportunity to explore how artists make and think about art and ideas about our collective memory—not just what we remember but how and why. Prevailing themes in her work include bioethics, human nature, media and society, and time. Now in her fourth year as a member of the Fort Point Theatre Channel, she has designed costumes for FPTC’s Codes of Conduct, The Time of Your Life, Present Imperfect, and Carny Knowledge and appeared as Mary in The Time of Your Life. This is her first experience working with a team to create a three-dimensional cartoon city for an ensemble of actors dressed mostly as ballerinas who dance with the stars and clouds and have tea with Gorky. 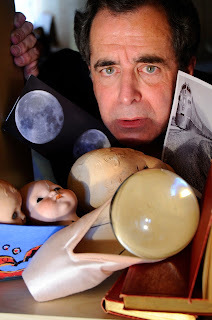 Robert D. Murphy (Joseph Cornell) is an actor and playwright based in Boston. For Fort Point Channel Theatre, he starred in The Time of Your Life, staged at Lucky’s Lounge (to which Murphy has subsequently returned for the Sinatra Brunch). He has also performed with Boston Playwrights’ Theatre, SpeakEasy Stage, Zeitgeist Stage Company, Underground Railway Theatre, North Shore Music Theatre, Stoneham Theatre, and the Weston (VT) Playhouse. He played the inscrutable Dr. Harden in several episodes of the Showtime series Brotherhood. He has run countless laps of the Boston Theatre Marathon and his play Client Number One was produced in the 2008 edition. His other plays have been featured in SLAMBoston (Company One), FeverFest09 (Small Theatre Alliance of Boston), Moments of Play (Salem Theatre Company), and Exclamation Point #8 (Fort Point Theatre Channel). His play Bollywood Ending was recently published by Smith & Krause in Best 10-Minute Plays 2010. He is a graduate of Amherst College and a member of Actor’s Equity and the Screen Actors Guild. Fort Point Theatre Channel is dedicated to creating and sustaining new configurations of the performing arts. FPTC brings together an ensemble of artists from the worlds of theater, music, visual arts, and everything in between as a forum for collaborative expression while enriching the Fort Point community, Boston, and beyond.